For the town in Nottinghamshire, UK, see Worksop. This article is about mechanical engineering. For other uses, see Workshop (disambiguation). 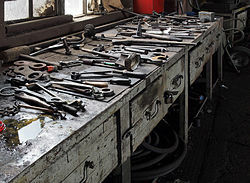 This museum workshop containing tools and supplies has been in use for decades. Beginning with the Industrial Revolution era, a workshop may be a room, rooms or building which provides both the area and tools (or machinery) that may be required for the manufacture or repair of manufactured goods. Workshops were the only places of production until the advent of industrialization and the development of larger factories. 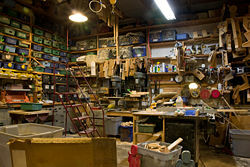 In the 20th and 21st century, many Western homes contain a workshop in the garage, basement, or an external shed. Home workshops typically contain a workbench, hand tools, power tools and other hardware. Along with their practical applications for repair goods or do small manufacturing runs, workshops are used to tinker and make prototypes. Workshops may vary in industrial focus. For instance, some workshops may focus on automotive repair or restoration. Woodworking is one of the most common focuses, but metalworking, electronics work, and many types of electronic prototyping may be done. In some repair industries, such as locomotives and aircraft, the repair operations have specialized workshops called back shops or railway workshops. Most repairs are carried out in small workshops, except where an industrial service is needed. ^ Flaherty, Joe (May 14, 2012). "Ford + TechShop: Getting Employees to Tinker". Wired. ^ Burress, Charles (December 22, 1997). "A Tinkerer's Paradise in Berkeley / Young, old inventors are offered tools, techniques and inspiration". SF Chronicle. ^ Carlson, Adam (September 5, 2013). "Top 8 Tools for Building a Personal Prototyping Laboratory". EE Times. Wikimedia Commons has media related to Workshops.